The inverse is the ability to move through or move the world around you, to project yourself into the world, to externalize your movement capacity, parkour, object manipulation, and combat. This concept crystalized for me while visiting Amos Rendao in boulder last November. Amos is one of the most impressive movers I have had the joy to train with. He is fast and fearless in overcoming obstacles with a really exceptional ability to solve complex sequences of movements on the fly. These skills have allowed him to be a consistent top five finisher in all the major national parkour competitions of the last three years. He is also a well trained martial artist and a dancer, and yet he is not especially strong. His reactive strength is good but not great, he has poor overhead range of motion, poor squat flexibility, he can not do the splits or press to handstand, or rotate through bridges or do tons of gymnastics strength skills. Is he then not a good mover? Would you rather have those things than the ability to run and climb boldly across rooftops, to feel confident taking big falls, to defend yourself in a fight, to roll painlessly away from getting hit by a car, or side flip over a wall to scare of a group of muggers, or to be able to easily pick up dance choreography and dance freely across a variety of styles? The ideal in movement would be to have both, but in the culture of people pursuing the concept of movement, I see far too much focus on these internal skills, and too little on their capacity to apply movement in the world around them. 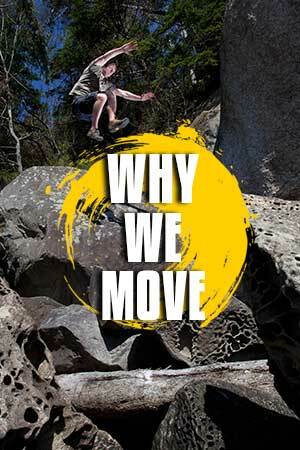 In the culture of parkour the focus is to external a balance should be sought, strength and mobility help our bodies survive the things we want to ask of them, too much focus just on the prerequisites will not gain you full freedom, though.